Picking blackberries for the fruit shares…so gorgeous! Hope you are having a wonderful week. 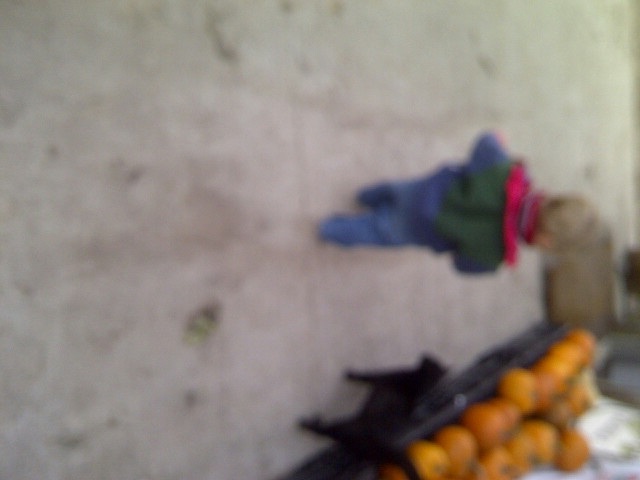 We’ve been busy picking all sorts of yummy things as usual (more broccoli, now some cauliflower, and kohlrabi). What do you do with some kohlrabi you say? It’s got a nice crunchy texture and is in the brassica family like broccoli. The taste I find is similar. I peeled and sloced mine as a crudite, and also peeled and grated another one for in some collard green wraps with salmon salad and lettuce. 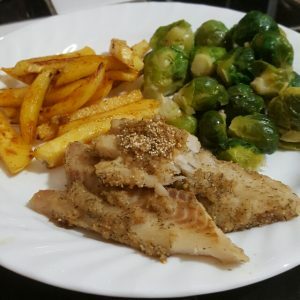 What a satisfying and easy meal it was, and it’s low carb, gluten and dairy free as well. I am super stoked about Melanie at Sparks Honey’s first harvest of the year with the bees living on our farm. I never knew the taste could vary that much in honey, but seriously, this is the best honey I’ve tasted! Looks like the organic veggie life is agreeing with our 6 legged friends :). 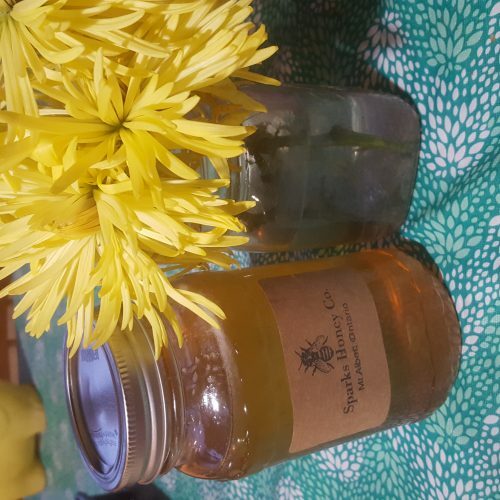 If you are dying to know how great it tastes, or want the health benefits of raw local honey, message me and I’ll send a jar with your farm share or pick it up from the farm store. The cost is $15 for 2lbs. 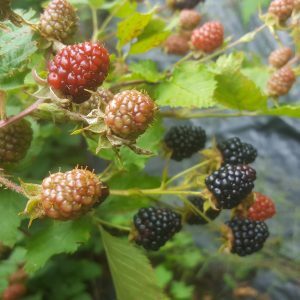 This week I had the immense but slightly painful pleasure of picking blackberries! Those thorns had my by the head and shirt at some points, but they are so worth it! What a treat for me. This was the first time I got to try them freshly picked. Hope you are as jazzed as I am fruit share people. Watermelom will be ready so soon! They really look gorgeous out there. Maybe 1 more week, and green beans are coming soon too. Another new item is those pickling cucumbers. We will have them for bulk orders soon, but we thought we’d give you the first taste. No, you do not have to go to great efforts to enjoy pickles. Here’s an easy recipe to savour the fresh pickles for longer. Hope you enjoy the fruits of our labours! 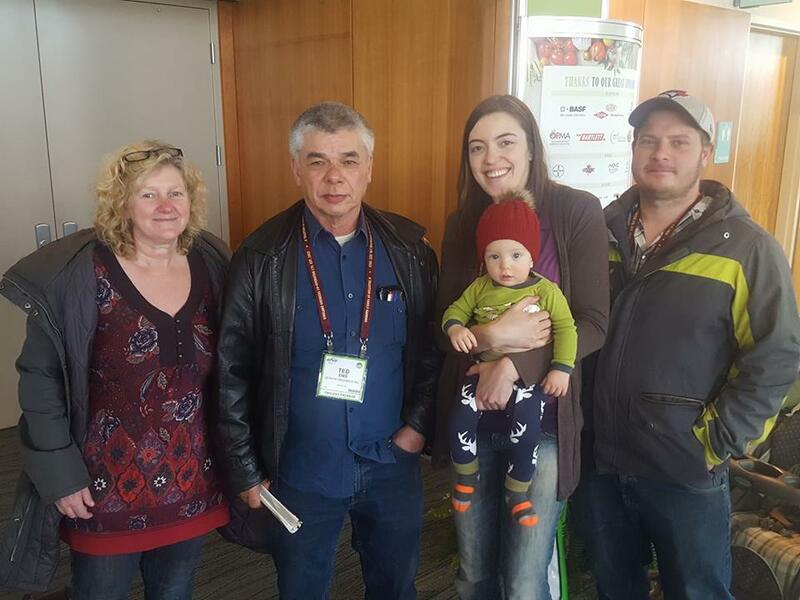 This week was an exciting one as all 3 of the farm owners, the owner of farm share (myself), and our littlest sprout were able to take a couple days away at the Ontario Fruit and Vegetable Convention in Niagara Falls. We go to this conference most years, but I especially enjoyed this one. 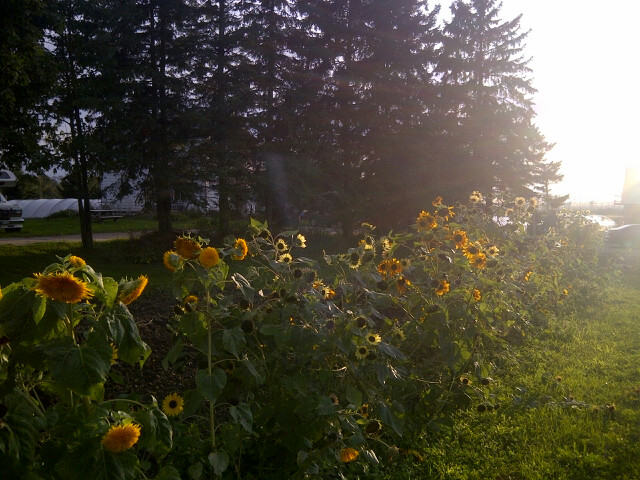 I learned more about Jerusalem artichokes, the funky tubers in your veggie bins this week. Some fun facts: the are indigenous to North America and one of the first cultivated plants in North America. The First Nations People were already using it in 1605 when it was first recorded by early settlers. What was even more exciting to discover was that they are rich in inulin, a prebiotic that is stellar for our digestive and immune systems! I’ve learned you can make them into pickles, but for now, a creamy soup is the perfect way to enjoy these tubers. 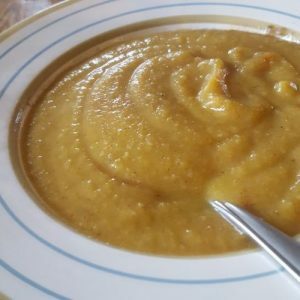 I myself was torn between making butternut squash soup and jerusalem artichoke soup this week, having both items in our shares, so I decided on…both! I was excited to get all these nutrients into my family, from the grown-ups, to the kids, to the baby! 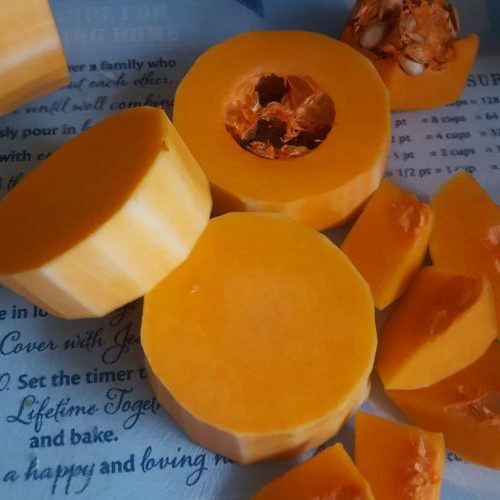 After peeling, I slice the butternut squash thickly. 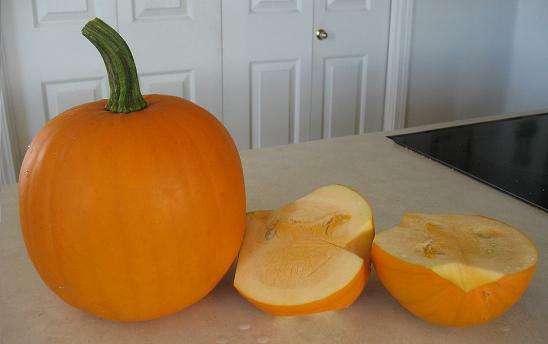 The rounded end of the squash will have seeds. I make about 5 angular cuts to separate the seeds from the flesh, creating cubes as I go. 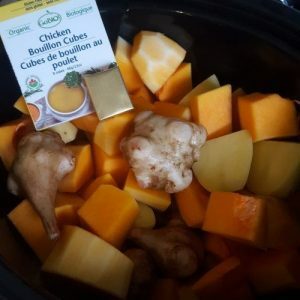 All the ingredients in the slow cooker, ready to go! Place all ingredients except coconut milk in a slow cooker on high. Cook 4-5 hours. Transfer to blender or blend with immersion blender, being extra cautious with the hot liquid. Pour in coconut milk and mix. Enjoy! Well you’ve got your lovely bunch of vegetables (and maybe fruit too). Could you use some inspiration? Maybe a slightly embarrassing story about my ineptitude and sheer ignorance with avocados? Well, here come the story and recipes. I was joining this group of farmer ladies for a luncheon, already feeling like a bit of an imposter because many of these women lead their own farms…bottle feed lambs, have kept them in their houses to protect against the cold…know all about livestock and germination and the like, and I married into this gig not knowing a bunch of kale from a head of bok choy. For some reason I thought it was wise to offer to bring the guacamole, a dish I loved but had never made. At least I knew you needed avocados…so I went to the store that same day and brought home my first bag of avocados. My first challenge was getting into them. I think I used a vegetable peeler which worked ok, managed to wrestle the pits out and then as per the recipe, began to “mash” them. I put all of my might into the mashing and even bent my masher. No results. Then I got out the mixer and gave that a go. Still, nothing was mashed about those avocadoes. Next, I got out the blender and let that sad little thing try to get somewhere, stopping to mix it around. I think at the end I ended up with some half decent guacamole, but let me save you the trouble. Blackish skin, a little give or tenderness when lightly felt with your fingers= just right. Now that I have at least a few hundred avocadoes under my belt, I like to cut mine around the middle, and twist the two halves in opposite direction tovopen. Then I normally cut square shapes right into the half and scoop out. You can also peel away the skin with a properly ripened avocado. -enjoy! Add some berries or bananas for a delicious snack or dessert full of fruit and healthy fats. And for the rutabaga…a few people swapped theirs out this week. I don’t think they’ve given these fries a try! While the dietary fibre, potassium, manganese and vitamin C make these a great choice, they really hold up on the taste end too. They definitely are more filling then their potato counterparts and ended up with a nice tender crisp texture in the oven. 1. Preheat oven to 450 degrees. Toss rutabaga fries in olive oil and spread out on large baking sheet. Sprinkle with salt and paprika. 1. Put water in the bottom of a sauce pan and place washed brussels sprouts in steaming basket inside. 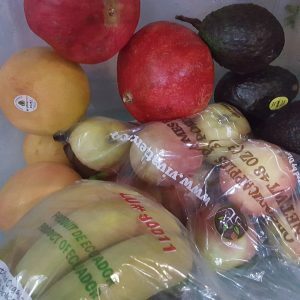 This is the second-last week of farm share, and the last week for some of you with biweekly boxes. It’s hard to believe another season is over, but admittedly my motivation go harvest out in the fields cools off with my frozen toes. On a warmer note, this week’s bin is just crying out for some good soups. I believe everything in your box would be delightful in one of 3 soup ideas listed below. This week there are some back to back frosts happening, so the fields are pretty much empty now, save a few frost-hardy crops. Delightfully, there are still many different items available and I didn’t have a need to desperately hoard things to have enough for your last few boxes. This time of year I get very possessive of everything grown on the farm that’s in limited quantity. I don’t want to end up giving you 3 types of kale in your box at once, and I won’t need to. Phew! Perhaps you are eager to pick out your own comfort food staples from the grocery store after a season of creatively cooking the farm-fresh variety we sent your way. 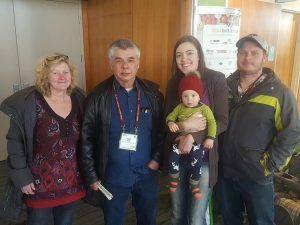 For those faced with a limited organic selection (especially in Durham), one of the farm’s owners, Ted has opened up Teddy’s Organic Market in downtown Uxbridge, (www.teddysorganicmarket.com). 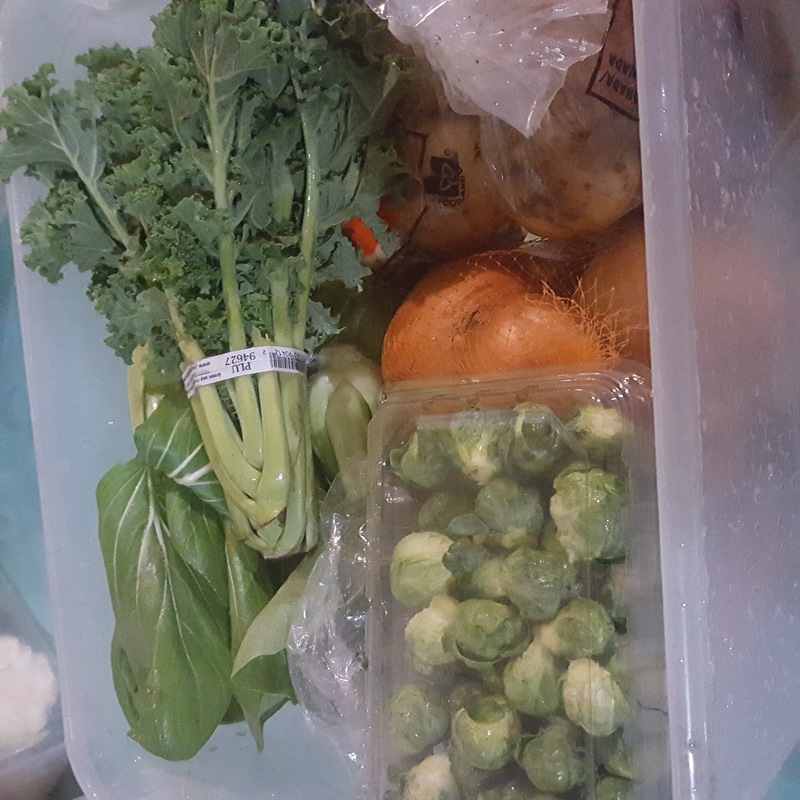 Those of you from urban areas still wanting home delivery and as much of local produce as you can get through the winter and spring may wish to check out https://toronto.greenearthorganics.com . I have long wanted to create a winter share myself, but desiring to put my best into both home and work life means keeping farm share seasonal for now. jerusalem artichokes (not sure about this new tuber? Learn to love it for all the good stuff in it- see a nutrition profile here on this iron and potassium powerhouse http://nutritiondata.self.com/facts/vegetables-and-vegetable-products/2456/2 ). Mash it together with mashed potatoes for an easy nutrition boost. No need to peel the skin, just wash well). I’ve even eaten mine in a twist on shepherd’s pie. 1. Place a large stockpot over medium heat heat and add onions, carrot and celery. Cook for about 5 mins or until softened. Add the garlic and a pinch of red pepper flakes and cook for about 1 min or until garlic begins to colour. 2. Add the zucchini and green beans, season with salt and pepper, add the turmeric, stir and cook for about 3 mins. Add the tomatoes and water, raise heat to high and bring to a boil. 3. Lower the heat to medium-low and allow the soup to gently boil uncovered for 20 mins. Add quinoa and cover for 15 mins. Remove the cover, add kale and canned beans (more water if needed), bring back to a gentle boil and cook for another 5 minutes or until the kale is tender. Grate the parmesan, add garlic chives and serve (or do in individual servings). An easy and amicable soup that eats a potato soup’s heart out nutrition-wise. Melt the oil in a medium-sized saucepan over high heat, add garlic and leek whites and cook until soft, about 2 mins. Add jerusalem artichokes and sautee about 2 mins. Add stock and leeks and simmer until chokes are tender. Add milk substitute (if using) and bring back to a boil. Season with salt and pepper. Puree in blender until smooth. Strain through a fine sieve (I never remembered doing this and it tasted fine to me). Keep warm. Sprinkle with chive and serve. Enjoy your last (or almost last) taste of this year’s harvest! Well, I think it is officially cold season. Many viruses have been shared among my family and friends but my little family has escaped with a couple days of very mild symptoms. Thinking of the veggies in your farm shares this week- kale, brussels sprouts, bok choy and sweet peppers, it is interesting to note what nutritional superstars they are for their abundance of vitamins and minerals, especially much-needed vitamin C. I see it as a heaven-sent blessing that such veggies would come ready just as the temperatures dip and our immune systems come under fire. So eat up and arm your body to fight off those germs. Also, remember this is no time to cheat on your sleep. Cheat- and you will be caught…by a bug! (Or so my experience warns). red or green leaf lettuce (probably the last week- it is still coming out of the fields! Can I just recommend not overcooking. I think many of us think we hate them because we`ve only ever eaten them previously frozen and cooked until colourless. They`re actually nice raw. One of my staff told me about an idea that had her teenage relatives fighting each other for seconds. She baked them in the oven till tender-crisp, with lightly pre-cooked bacon (1/3 of a pound for an 8×8 dish full) and Parmesan cheese on top. Combine lemon juice, dijon mustard, shallot, garlic, salt and pepper in a small bowl. Set aside. Mix thinly sliced kale and shredded brussels sprouts in a large bowl. Measure ½ cup oil into a cup. Spoon 1 tbsp. Oil from cup into small skillet; heat oil over med high heat. Add almonds to skillet and stir until golden brown in spots, 2 mins. Transfer nuts to paper towel-lined plate. Sprinkle almonds lightly with salt. Slowly stir remaining olive oil in cup into lemon-juice mixture. Season dressing to taste with salt and pepper. Add dressing and cheese to kale mixture. Toss to coat. Season with salt and pepper to taste. Garnish with almonds. Here`s hoping your immune systems are armed and ready for victory! Know your farmer: encouraging your kids to eat well and also seeing the value in the food you purchase are both bound to happen in the process. First of all, vegetables are fascinating! There is always something growing in our front field and if you come during store hours, I’m sure Jannette will be sure to let you take a peek. In case there was any doubt we’re organic, you’ll find some weeds too. As for your perspective on the cost of food- that is likely to change as you observe or take part in getting your own hands dirty to harvest some food. It just about kills me to see green onions sell 2 bunches for a dollar, knowing how labour-intensive they are post-harvest (peeling, washing and bunching). The other day, I was checking out tomato sauces in the grocery store because I was wondering why some varieties (ie. Ragu and store brands) sell for only $1.50 while even conventional sauces from other brands like Classico sell for $3.00 plus. Lo and behold, the mystery was solved- all cheap brands that I saw used soy protein (and likely GMO) as filler. Not tomato sauce, but tomato-GMO soy surprise! Funny, it didn’t highlight that feature on the label. So, case in point, growing food costs money, and suspicion should arise if one company is somehow able to provide the same product at half the price. Read the label, or better yet, make your own. It’s a full basket this week- check below for a gorgeous and flavourful salad idea. Trade turkey and cheese for nuts for vegan diets. Serves 1 as entrée. Cut and wash romaine, raddichio and Bokchoy. Dry and arrange on plate. Arrange beet, cucumber, orange and turkey as artistically as you desire. Sprinkle feta over top. Add drizzle of balsamic dressing and serve as a satisfying entrée. Remember, read those labels…or better that- eat things without labels . Farm Share Week 17 *Thanksgiving! 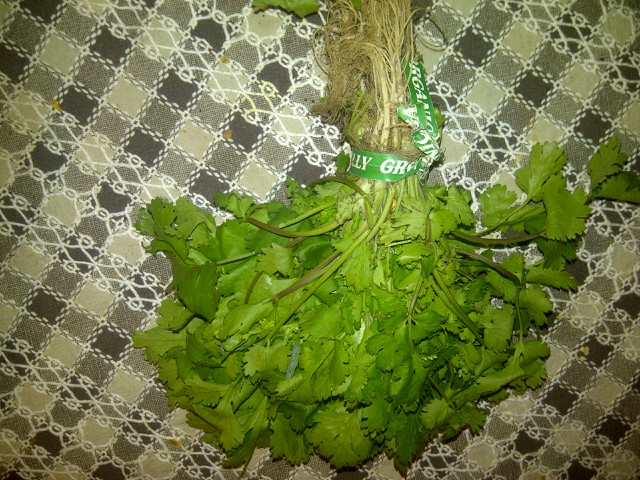 Cilantro: adds some zing to Mexican, Thai and Indian dishes, along with loads of vitamin C.
First of all, apologies for missing my post last week. My country internet has been making it an extremely slow task. But onto Week 17, Thanksgiving! I love this holiday, as it always brings my families together and involves an indulgent feast of plenty. As you gather with your family, or even if you don’t, do everything in Thankfullness. Just check out the array of foods before you- we are rich like few other nations in the world. Doing loads of dishes? Be thankful for the family that created the dirty dishes, and the blessing of having so many. Take a walk outside and enjoy the vibrant colours of fall alongside the crispness of the air. I am always enamoured with the way the world is lit up before and after sunset, highlighting everything with a golden glow. Also consider, is there someone who is far from family that will be spending Thanksgiving alone? What’s one more mouth to feed, and I’m sure a new face will enliven the dinner conversation. Note: I wanted to give everyone squash again, but I ran out of room in the box. Look for some next week. I got excited about this stuffing recipe with black kale, fresh sage, oregano and celery! Much of your box was inspired by this receipe. Perfect for Thanksgiving. 1. In medium saucepan, bring spelt and 4 cups water to a boil. Cover, reduce heat to low and simmer until tender, about 25 mins. Drain. 2. Meanwhile, on 2 baking sheets, arrange bread on single layer. Toast at 300 degrees until crisp, about 20 minutes. Transfer to large bowl. 3. Heat large, nonstick skillet over medium-high heat. Add pancetta; fry, stirring frequently, for 2 minutes. Add sauage and cook, breaking up sausage, until pancetta is crisp and sauage is golden brown, about 5 minutes. With slotted spoon, transfer [ancetta and sauage to paper-towel lined bowl to drain. Discard excess fat in skillet. 4. In skillet, stir together onions, celery, garlic, sage and oregano. Cook, stirring frequently, until onions are translucent, about 8 mins. Scrape over bread. 5. In skillet, stir together kale and broth. Cook, stirring frequently, until kale is just wilted, about 2 minutes. Scrape over bread mixture. 6. Stir pancetta mixture, spelt, tomatoes and beans into bread mixture. Season with salt and pepper if desired. Scrape into 13×9 inch pan, sprinkle with parmesan and cover with foil. 7. Bake at 400 for 20 minutes, uncover and bake until top is crisp and dressing is hot, about 10 to 15 minutes. 1/3 cup slivered almonds, toasted. 1. In large bowl, combine kale, peas and cherries. 2. 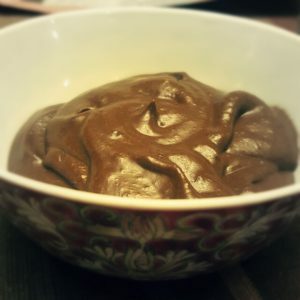 In seperate bowl, whisk together lemon juice, oil and umami paste. Toss with kale mixture to coat. 3. Top with almonds just before serving. This week, choose to overlook the hangups and headaches and focus on the blessings around you. I bet you won’t have to look far! Fall is glorious!The colours, the crisp air, and the hearty fall vegetables and soups that are just so satisfying after a nature hike or simply tending the fall garden. There is a certain connectedness I feel to nature as the seasons change, and the thought of being in a climate with steady, predicatable temperatures almost makes me feel sad for those who are not greeted by a whole new climate every few months. No guarantees that I’ll feel the same come February however! Delicious sugar pie pumkins- Don’t be fooled by the name: they have a low glycemic load and they are good for so much more than pie. This week we have a true symbol of autumn, the pumpkin. I hope you see it not as an obligation to try to compete with those capable pie makers in your life, but as a challenge to try something new with this tasty and nutritious food. Simply slice it in half, scoop out the seeds (and keep them to toast and snack on if you wish) and bake the two halves face down at 350 degrees until soft. Scoop the flesh right out of the skin, puree and get creative. One pumpkin will probably yeild multiple recipes. Pumpkin is a delicious way to amp up pancakes with vitamin E, B6, A & C, iron, folate and fibre (to name a few) and give a delicious flavour twist. Of course cinnamon and pumpkin go together amazingly. Also, consider making some tasty home-made muffins with pumpkin. While baked goods are obviously a treat due to the sugar in them, treating yourself to a homemade muffin means only about 1/3 of the salt, sugar and calories of a similar Tim Hortons muffin. 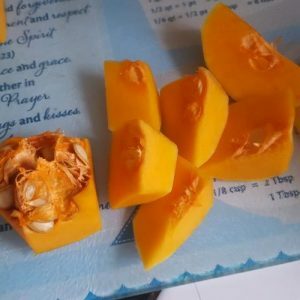 I discovered this through an amazing App called MyFitnessPal which details the nutritional aspects of different food items (both homemade and pre-made) in the context of your nutrition goals. I am not trying to pick on Timmies here, just know that most popular chains tailor their foods toward the tastes of the salt-and-sugar-addicted masses: hence the homemade advantage. If anyone knows a good pumpkin muffin recipe with reduced sugar and high fibre, please share! How about a hearty pumpkin soup recipe? This looks like a good choice for those with a taste for spicy and adventurous foods. 1. Heat the oil in big pot and add onion and garlic. After 3-4 minutes, add red cabbage, banana pepper, mustard seeds and cumin. Cook, stirring, for 8-10 minutes. 2. Add paprika, pumpkin puree, vegetable stock, yogurt and spices, and simmer for 1/2 hour. Use a hand blender to make the texture more smoothe if desired. Enjoy! This one is simpler and looks like it would have a wider appeal. 1. Chop onion and celery and sautee with grated carrots in butter in soup pot until tender. 3. If eating right away, add cream and heat on medium while stirring. Serves 6 as an appetizer. 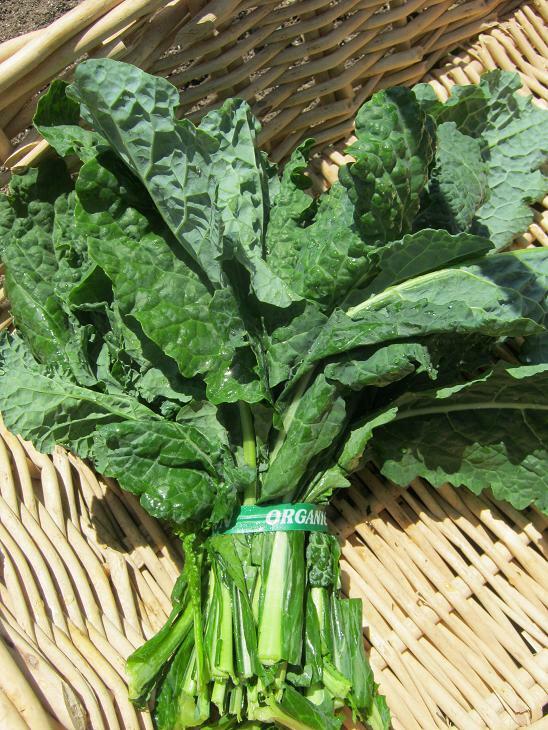 Kale: anti-oxidant, anti-inflammatory, lowers cholesterol, fights cancer, and supports the body’s detoxification system. Not bad for a little bunch of greens! 1.massage kale leaves with olive oil. 2. When fully covered, add lemon juice, pepper and nutritional yeast flakes. Toss and serve immediately. Here is one of Helen, our summer packing staff’s favourites. She also happens to be Greek, so needless to say, she knows a thing or two about good Greek cuisine. This casserole is a cross between two of my favorite Greek meals, moussaka and pastitsio. For the most traditional flavor, use ground lamb rather than turkey, and use authentic feta cheese made from sheep’s milk. Serve it with Honey-Glazed Carrots., may use lamb or vegetarian ground meat. Helen recommends the beef or turkey and to use more zucchini than this recipe calls for. 1. In a medium saucepan, bring about 4 cups of water to a boil. When the water is boiling rapidly, add the orzo and cook it for 6 – 8 minutes until it is al dente. Drain it. 3. Heat 1 Tbsp. of the oil in a large heavy skillet over medium to medium-high heat. Add the zucchini and onions and cook them until the onions are translucent and the zucchini is tender-crisp, about 10 minutes. Stir in the dill and put the vegetable mixture in the casserole. Stir in the cooked orzo. 4. Heat the remaining oil in the same skillet and brown the meat, breaking it up with a spatula. When it is almost browned, add the cinnamon, salt and garlic powder and mix evenly, then add the tomato paste and tomato sauce, and stir it until the mixture is bubbly. Pour the meat mixture over the vegetables and orzo, and top it evenly with the cheese. 5. Cover the casserole tightly and bake it for 20 minutes (alternatively, you can refrigerate it for up to 2 days or freeze it for up to 3 months at this point). (Meanwhile, prepare the carrots, if you are serving them.) Serve it hot, making sure to get some of each of the layers in each serving. Scramble Flavor Booster: Add ½ tsp. dried oregano to the sautéed vegetables. To make Honey-Glazed Carrots, heat 1 Tbsp. butter in a large heavy skillet over medium heat. Add 1 lb. of sliced carrots and 1 – 2 tsp. honey, and stir to coat the carrots with the butter and honey. Sauté the carrots, stirring occasionally, for 8 – 10 minutes until they are tender and slightly browned. If the carrots are getting too browned, reduce the heat. Season the carrots with up to 1/8 tsp. salt before serving, if desired. In large bowl, whisk together oil, lemon juice, dill, garlic, salt and pepper. Add mushrooms and toss to coat. Let stand for 15 minutes, stirring occasionally. Meanwhile, halve green beans diagonally. Blanch in saucepan of boiling water until tender-crisp, 3 to 5 minutes. Drain and cool in ice bath. Drain well and pat dry with towel. Add beans and fennel to mushrooms; toss to coat well. Serve immediately or refrigerate for up to 4 hours. Enjoy your new discoveries this week.